The SDO JSOC has experienced a disk controller failure. The near-real-time images will not be produced until the controller can be replaced. Stay tuned for updates. Check out the new SDO app at the Android marketplace! You can view SDO images on your Android phone anywhere you have a network connection. 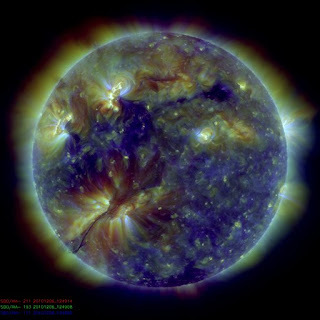 We will feature other apps that show SDO data this week. Dec. 13, 2010: On August 1, 2010, an entire hemisphere of the sun erupted. Filaments of magnetism snapped and exploded, shock waves raced across the stellar surface, billion-ton clouds of hot gas billowed into space. Astronomers knew they had witnessed something big. It was so big, it may have shattered old ideas about solar activity. 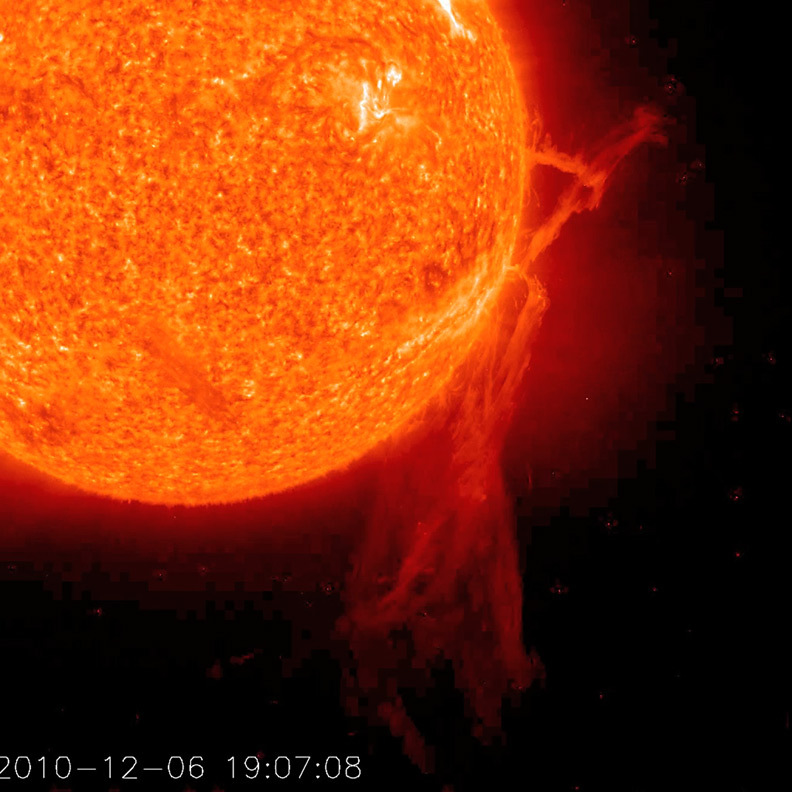 The extraordinary Filament eruption caught by SDO on December 6, 2010 was also seen by the STEREO behind spacecraft. There is a new addition to the SDO data section of the website. We are now producing 48 hour subfield movies. These movies are similar to youtube in that they are streaming videos. The .flv files are updates every 30 minutes and there are five movies for every limb of the sun. 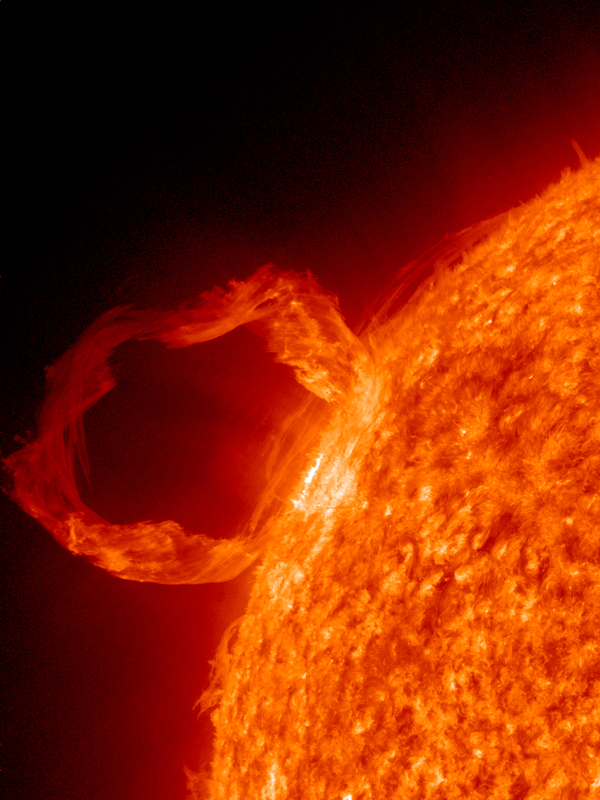 This SDO image was chosen for LIFE magazine's 2010 Pictures of Year. Today (December 9) the AIA Science Team is adjusting the guide telescopes on AIA. One of these small telescopes is mounted above each science telescope, allowing the pointing to be precisely controlled. Every so often we need to tune the control tables. Today was one of those times. Small motions of the images will be seen in the data on the SDO website. John Roach writes:NASA's Solar Dynamics Observatory has captured what appears to be a giant snake slithering along the sun's southeastern limb. The feature is actually a magnetic loop of dense gas suspended over the solar surface. The snaky filament, which was first noticed last week by NASA's STEREO-B spacecraft stationed over the sun's eastern horizon, showed signs of instability and had the potential for an impressive eruption, according to SpaceWeather.com. You've got to see SpaceWeather's time-lapse animated image of the flare-up. There will be a lunar transit tomorrow that will be visible by SDO. The website is back up. Notice: The SDO Website will be down for approximately 1 hour. Reason: SDO servers are being moved to a new location.